Sometime before Christmas my Mom and Das sent us a giant ham. It has been a lifesaver when it comes to saving dinner. When we are stuck for food ideas I just pull out a bag o’ ham and we’re good to go. The latest meal plan involved a package of dried-out potato slices that, with proper care, could become scalloped potatoes. Lloyd decided he would make them. Then he read the directions. Then I made the potatoes. 1) In our pan that has the hollow handle, put two measuring cups worth of hot water in, two big pats of butter, and a half-cup (measuring cup) of milk. Don’t use that jug of skim milk that has been in the fridge since Brad was here at Christmas. See how it is dangerously swollen? That’s some sort of fermentation going on, and I don’t want to deal with it. Develop a blind spot for that jug like I have, and for heaven’s sake, don’t bump that jug. Use a scoop of the powdered milk and a half-cup of water and… oh, just move over and let me do this part. Add the potato discs. 2) Put the pan on a big burner and turn it to Hi. It is not greeting you – that is the temperature. Watch the pan for about 3 minutes, and it will boil. Stir it once per minute, scraping the bottom of the pan. 3) When it has started to boil, turn the heat to 2, set the timer to 15 minutes (and press Start) and cover the pan with the glass lid. Stir it once every 90 seconds (you wanted me to be specific). You might want to bring a book over to the stove. There. What did I miss? turn it to Hi. It is not greeting you. — Ha! oh, just move over and let me do this part. -- Yup. IANAC, but I would say that the main point of stirring is to keep stuff from sticking to the pan. 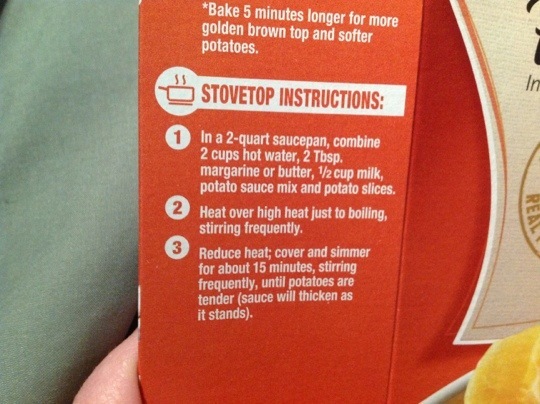 If it’s sticking, you’re not stirring frequently enough. If, on the other hand, you’re feigning ignorance so Lauren will say: “let me do this”… well done, sir. Idahoan instant potatoes are my “go to” when I am in a hurry. I’m sure Lloyd could follow those directions! Once, I tried to make garlic mashed potatoes Quite a tiresome and time consuming set of directions. So I asked a friend how she made them. She told me about the Idahoan instant stuff. Roasted garlic, or baby reds, or homestyle. Take your pick. Good enough! They are easy to stir once and then let them sit. HAHAHA! This made me laugh! YOU FUNNY LAUREN! !